Note: This article is about the 2018 game My Riding Stables: Your Horse Breeding, which was released on Playstation 4 and Nintendo Switch under the title My Riding Stables: Life With Horses. When I first read that the My Riding Stables series would be getting a new entry, I was feeling cautiously hopeful. The latest game in the franchise that I had played was not good, but had many of the cornerstones of what a good horse game might be, as you can read in detail in my review. Looking at the promotional material for the newest game, I was at least cautiously optimistic: a remake of an okay-ish horse game, with a new stylized look? Surely, if this game went about improving the right things that bothered me about the last version, we might finally have a decent horse game on our hands. At the risk of “spoiling” this review: this game is absolutely not decent. The first entry in the My Riding Stables series was developed and initially published 2005 in Germany, where it bore the name Pferd & Pony: Mein Gestüt. This original game - made by none other than RadonLabs, the studio who later went on to develop the aforementioned Riding Star 2, with a presumably comparable amount of horse game enthusiasm - was later re-released on Steam under the title My Riding Stables: Your Horse World by RokaPublish under their somewhat intransparent familyplay label. I have not played that one myself, but unlike its 2008 sequel, it only has mixed (50% recommended) user reviews on Steam these days. The second game of the franchise was developed by Sproing under the working title Mein Gestüt 2. Unlike its PC predecessor however, the plan for this project was to release it as a Nintendo Wii exclusive. Under these circumstances and as the first such game on that platform, it made no more sense to the publisher to have a “2” in the name, and upon the Wii release in 2008, the title was changed to Mein Gestüt: Ein Leben Für Die Pferde. Or in its English translation: My Riding Stables: Life With Horses. This game was later re-released on Steam as well, again carrying the Life With Horses subtitle. When I wrote my review of the game last fall, I did not know any of this and wrongly assumed the 2014 Steam release was the original one. This title currently enjoys the best rating of the series on Steam with Very Positive (81% recommended) user reviews. The latest My Riding Stables title was developed and released in 2018. The game has so far been released on Nintendo Switch and PlayStation 4 as My Riding Stables: Life With Horses and on Steam as My Riding Stables: Your Horse Breeding. Developer Independent Arts Software from Germany has a couple of other horse games under their belt including Bibi & Tina: Adventures with Horses, but had previously not been involved with the My Riding Stables franchise. The game’s development was funded by Markt + Technik, which is a publishing company for technical literature and software instructions, without any information about their game publishing business to be found. On Steam, the publishing is handled by RokaPublish under the label “familyplay”. This game is a remake of the 2008 version with new visuals, but many of the same problems and a bunch of new ones on top. As best I can tell, much of this information cannot be found online and I only learned the details by asking the developers of the 2008 game. I apologize for this excessively long introduction before the review itself, but I consider it a crucial prerequisite in talking about horse games to know which specific game we’re talking about in the first place. For what it’s worth, I have only tested the Steam, but based on screenshots and let’s play videos, the Switch and PS4 versions are largely identical. The utter lack of information surrounding these games — none of the companies involved in the development include them in their online portfolios, for example, and none of these games have Wikipedia pages that would allow anyone to get an overview of the situation — results in confusion for anyone who would like to casually inform themselves of the games’ quality. And for a low quality entry in a series of at least mediocre games, this is to the average consumer’s detriment. Because after all, who would ever even think to look deeper into the exact specifications and features of individual horse games, let alone subject them to any sort of scrutiny beyond basically treating them as a joke or a children’s toy…? That’s right. The Mane Quest is on. Where Life With Horses had these little newspaper articles for a stylized way of informing you about your own success at several points in the game, Your Horse Breeding mostly relegates these messages to the regular UI after this initial screen. It does it without changing the actual text however, making the announcements stand out oddly in tone and wording. In My Riding Stables: Your Horse Breeding, your task is to bring a rundown stud farm back to its former glory, or so the game’s promotional texts try to tell you. For the most part, the game mechanics and goals are copied exactly from the 2008 game My Riding Stables: Life With Horses, but one cannot help to notice that corners have been cut at every opportunity in the adaptation, without adding much value anywhere else. You start the game by creating your character and choosing a horse. Once again this part looks very inclusive by having a Boy-Girl slider, but then ends up being a binary choice nonetheless. The horse coat colors are labelled inaccurately — “red” instead of chestnut, “light bay” instead of palomino — even though typing “horse coat colors” into google and looking at a chart is literally an effort of 10 seconds. But then again, somehow even Red Dead Redemption 2 managed to get that wrong, so maybe we ought to cut My Riding Stables some slack here. In addition, the “Friesian breed” comes in all colors in the game, despite the real breed being known for its predominantly black coat and a breed registry that explicitly excludes other coat colors. The Friesian is also much smaller than the Hanoverian and Andalusian, rather reversing the realities of these breeds’ characteristics. I love me some horse game realism. In the character creator where you enter your player’s name, you have to click letters or select them with the arrow keys because pressing letter keys on your keyboard results in triggering the wrong shortcuts. It’s things like these that work as a solid counter argument for whenever anyone claims horse games don’t have a bigger market because they only appeal to die hard horse fans: If that is really the intended audience, why do these games insist on getting such easily researched and easily implemented details which horse fans actually notice wrong? The game’s store descriptions for PS4 and Switch are a depressingly hilarious example of an attempt at making one feature sound like much more than it is. The feature list contains 7 bullet points, 4 of which are different rewordings of the same feature, “riding in the countryside”. But where the 2008 Life With Horses offered an open area to ride around in and find obstacles to train your horse’s jumping skill, all the riding in Your Horse Breeding is along fixed paths, with the player controlling only the speed and giving jump input. The effect of this change is that the riding grows boring practically from the start, instead of after the fourth or fifth try as it did in the 2008 game. The environments look alright, but the horse’s frantic twitching along the tight winding paths in later levels destroy the whatever horse riding immersion may have survived the out of synch rider animation. Perhaps not well visible in this gif: Apart from the rising trot being out of sync with the horse, the player character just twiches instantly back into the saddle instead of having a sitting down animation. Where MRS 08 brought in a tiny bit of realism by making riding towards the obstacle in a straight line part of the challenge in jumping and planning your route, the new game further abandons this by giving the player a jump button and making the obstacles barely wider than the horse itself, with the fixed paths of later racecourses often approaching obstacles at odd angles. The player can’t steer, so this left/right twitching is part of the fixed path you move on. As if to compensate for the lack of exploration in riding, the game’s Instant Mode, which is accessible from the main menu, lets you steer a saddled but riderless horse through an open area - without any goal or purpose however, and therefore not at all interesting once one has taken notice of a handful of the pretty environment models. The Instant Mode accessible from the main menu lets you move “freely”. When I initially saw the promotional images for this new game, I was pleased to see that is went for a cartoon style with stylized textures, colors and proportions. Too many horse games look dated and cheap merely by settling on a pseudo-realistic art style that is quite obviously outside of their budget, and I’m glad Your Horse Breeding isn’t one of them. Grooming a horse takes a solid minute, cleaning its hooves even longer. The horse’s idle animation doesn’t loop properly. Unfortunately the looks are put off by the lack of properly looping animations, a step which my animator coworker assures me can be an effort as minimal as copy-pasting a keyframe into the right place. The game now offers a bigger variety of clothing choices to unlock, some of which actually look like appropriate wear for riding or stable work. On the other hand, corners have been cut in leaving out things like bridles, halters or girths on the horses while leading or riding. The same few debatably fitting music tracks from the original game are reused and looping constantly, though thankfully the rare awkward voice lines are no longer included. As ways of earning money, the game once again offers Lunge Training and Massage minigames once the Training Hall and Therapy Center have been unlocked. 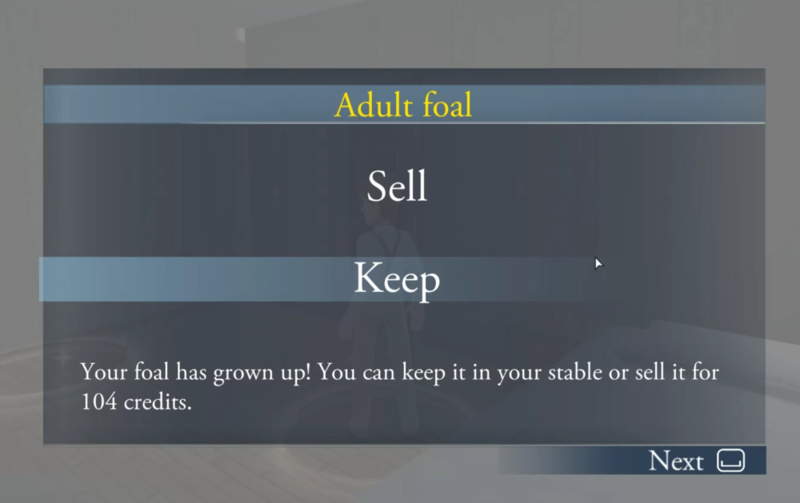 The game again demonstrates its lack of care in still calling the former “Foal Training” even though the minigame just uses the adult horse model now. The original minigame was unintuitive, but offered a decent little challenge once you figured out what to do by only letting the foal walk on the smaller or bigger circles depending on your next “checkpoint” and your time limit. This new iteration does away with that challenge by letting you change directions instantly at any time, without making the mechanic any more fun in the process. To give credit where it’s due, the massage minigame is shorter and therefore less tedious now, so.. Yay? Grooming your horse and cleaning its hooves is still utterly boring and takes forever, but thankfully there aren’t really any consequences if you just don’t do it. The video below is how long it takes to clean one hoof. You can have up to six horses with four hooves each. The money making minigames are no longer limited to being doable only twice per day, which makes grinding for money a lot less time-consuming. In turn however, the game’s balance is thrown off entirely, with the massage minigame being such a quick way to make money that you could complete all stable upgrades within a matter of days. Your progress is then limited by the horse races only being available on in-game Sundays, meaning you spend six days tediously feeding, grooming and training your one or several horses until you are allowed to progress a bit further. I eventually simply skipped several days in a row without feeding any animals, in order to be able to finish the game without entirely dying of boredom. Achieving Gold Shoes for horse care takes a while, but it’s the races that really hold your progress back. As a result of this balance mess, I actually played far enough this time to unlock guests — NPCs who disappear into the guest house once you invite them in — and the titular Horse Breeding, which amounts to selecting a stud for your horse in a menu and seeing an exact preview of the foal you’re going to get. After a few in-game days, a new adult horse appears in your paddock. I suppose I’m happy the game’s balance is so messed up, because this way it only took me about six hours to play through the full game and get all achievements, for which I would not have had the patience otherwise. But this relief at not having to spend more time with the game doesn’t exactly speak in its favor. As for functionality itself, the game isn’t so much “buggy” as it is just unfinished. There are a hundred small “quality of life” improvements that could easily have been made, with comparatively little additional time and effort. The Steam game’s origin as a low effort console port is evident in its user interface, mainly in the fact that although the mouse can (and should, for less frustration) be used for many of the grooming minigames, the UI prompts only ever show arrow key inputs. The WASD keys can be used to move at a jog, except that the W key is also mapped to trigger interactions when your character is near any objects, people or doors. The titular “horse breeding” happens in a menu where you preview the foal you’re going to get. After waiting three days, your grown up horse appears in the paddock. There are no foals visible in this game. Your “library” offers information on real-life horse care, but many of the texts are awkwardly written and badly formatted. The game contains a myriad more bad development choices, easily fixable mistakes and lack of polish, like that your default saddle is at the bottom of the interactive list, meaning you always have to scroll through the whole list to select a saddle up until the point where you can afford the most expensive one at the top. The controls and camera are absolutely horrendous, the time needed to brush the horse and clean its hooves could easily have been halved, the “books” with tips and tricks you can buy are in dire need of editing and formatting, the horse’s riding stats are confusing and poorly handled and all in all just about every aspect of the game is lacking. From a chat with the game’s publisher on Steam (more on that in an upcoming article about the game’s development), I know that there were even more such issues in the original Switch/PS4 game, with the Steam version already having fixed a number of rough edges. MRS 2008 was an almost solid game. With some improvements, a proper remake could have been a new high for the horse game genre. Unfortunately, that chance was missed: My Riding Stables: Your Horse Breeding screams “low budget” at every opportunity. That a product so obviously rushed and under-polished is being sold for $30 on PlayStation 4 and Nintendo Switch, while potentially still profiting from the positive reviews of its last iteration a decade ago borders on being a scam. All that is listed as “features” in the game’s store description and on the game’s physical box is technically there I suppose, but every single feature is executed in the most shallow and minimalistic way imaginable. Any indie game that dared sell itself for such a price while offering so little (not in playtime, but in care put into it, in gameplay fun and in overall polish), would be justifiably ripped apart for an overpriced mess by YouTube pundits and in Steam Reviewers. But on the rare occasion that any mainstream gaming commenters do take a look at horse games, they arrive at conclusions like “well this isn’t fun, but I guess the horse people are into this”, not realizing that not only does the game get plenty of things wrong about horses, but also that horse riding enthusiasts may have a developed sense for engaging gameplay and fun as well. My Riding Stables: Your Horse Breeding may be worth a purchase if you or your children have no demands or expectations for decent game design at all and are willing to put up with all of its flaws for the chance to spend a little bit of time in stable management. For anyone else though, I recommend taking those 20-30$ and putting them into a savings account for the point in the future when any game developer who actually respects this genre and its audience launches their crowdfunding campaign. The Mane Quest has reached out to the developers and publishers of MRS18 for comment. I hope to soon be able to provide insights into why and how this game was made as it was. Stay tuned. My Riding Stables: Your Horse Breeding was released on Steam in November 2018. The same game was released under the title My Riding Stables: Life With Horses on Nintendo Switch and PlayStation 4 in Summer 2018.